Poe's actor says the Resistance "just feels like it’s totally lost"
Although Star Wars 9 has the late Carrie Fisher reprise her role as princess/admiral/all together good person to have around Leia Organa via unused footage from previous films, it won't keep her character involved in the whole movie. 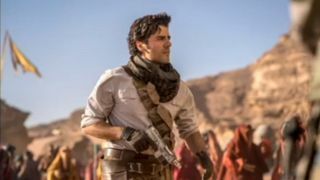 Poe Dameron actor Oscar Isaac revealed in an interview with IGN that his character will need to take on more of a leadership role with the Resistance throughout the course of The Rise of Skywalker because "Leia is gone." Though it was good news to hear that Leia's presence would continue in Star Wars 9 via footage of Fisher herself, it's not surprising to hear that her role will be limited. Repurposing scenes from the cutting room floor can only ever go so far before you either run out of footage or the connections are just too torturous to make. The question now is how Leia leaves the film; after how things ended for Han and Luke, is it too much to hope she just retires to a nice tropical vacation planet? However Leia's part in the Star Wars saga concludes, it sounds like Poe will try and fill the void she leaves behind. We met Poe as an ace pilot and icon of the Resistance in Star Wars: The Force Awakens, but we saw his brash, impetuous nature endanger both himself and his allies in Star Wars: The Last Jedi. Hopefully this final installment of the trilogy will let Poe grow into the noble leader that our heroes deserve. Get even more context on the upcoming film with our thorough Star Wars 9 trailer breakdown. Then see how everything lines up with our video Star Wars timeline.